Instructor Kevin Whitehead will answer all your questions when it comes to Flexwing Microlight flying. 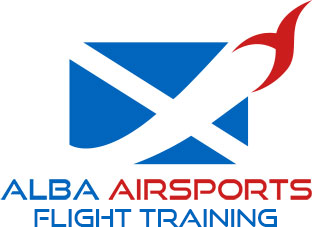 Alba Airsports in association with The Scottish Aero Club are the sole providers of microlight training in Perthshire. Situated in the gateway to the Highlands, we are just three miles to the North East of Perth city along the A94 towards Coupar Angus. We offer hourly and intensive pilot training for potential and converting pilots. We also offer introductory experience flights to the general public to offer a taste of what it’s like to fly one of these fantastic high performance flying machines. Our aim is to get as many people as possible to experience the thrill of flying a microlight. Book a trial flight today for that special friend or loved one, or simply come and have a go for yourself! It’s Fantastic – You won’t be disappointed! At Alba Airsports, we offer you the opportunity to purchase an introductory trial flight, and take to the skies in one of these fantastic flying machines. Also known as an Air Experience Flight, this is an ideal way of experiencing the exhilarating sensation of open cockpit flying. If you’ve always wondered what it might be like, then this is the way to find out! An ideal gift for the budding aviator, we offer 30-minute, 60-minute and the ultimate 90-minute trial flight. During the flight you will have the opportunity to take the controls and fly the aircraft yourself, or you can simply relax and enjoy the panoramic views of the beautiful Perthshire countryside, so don’t forget your camera! If you later decide to train for your pilots licence to fly a microlight, then your air experience flight will count towards your training. If you would like to purchase an introductory trial flight, then buying an experience flight gift voucher is the easiest way to proceed. The person receiving the gift can then book a specific date and time at a later stage, as our vouchers are valid for 12 months from purchase. If you already have a voucher and would like to book a date and time, then please call, email or simply pop in to arrange your flight. Perth Airport is Scotland’s premier general aviation licensed airfield and training establishment, and offers flight instruction through independent companies in Fixed Wing and Helicopter for Private Pilots and Commercial Pilots alike. For the Sport Aviation market, Alba Airsports offer flight training to NPPL level and introductory experience flights in Flexwing and Fixed wing 3 axis Microlights and Gyrocopters. Potential pilots and thrill-seekers alike will be able to trial and undertake Microlight training for issue of a National Private Pilots License (Microlights). Individuals who are reasonably fit and within the weight limits. The average student will spend from £3000 to £4000 to complete the full course of training. Students are charged for flight lessons based on ‘engine time’ (from engine start to engine stop). The current rate for a 1 hour flying lesson on a school aircraft is £120 for flexwing aircraft. All flight lessons include a pre-flight classroom briefing that will cover theoretical and practical elements of the upcoming air exercise. The pre-flight brief takes approx 30 –40 minutes and there is no charge for this classroom briefing. There are also nominal administration and processing charges for each exam when taken. Where a student feels he needs supplemental ground school tutoring, this can also be arranged on an hourly paid basis. Good condition second hand machines cost less than you would normally spend on a second hand car. New machines are also relatively inexpensive compared to conventional aircraft. Under the CAA Permit to Fly scheme, microlight aircraft owners can perform most scheduled maintenance requirements on their own. This keeps the cost of ownership to a minimum. An annual inspection by a certified inspector is required to ensure the aircraft is safe and airworthy (similar to a vehicle MOT) and the cost for this inspection is approximately £100. Microlight aircraft operate from airports, airfields, farm strips, private fields, etc so cost of hangarage varies depending on the location and facilities. Monthly hangarage rates for a fully rigged flexwing microlight aircraft average around £110/month at Perth Airfield where Alba Airsports is based. For those in syndicate ownership, the costs are shared by agreement amongst the aircraft owners keeping the cost of ownership lower still. The great all-rounder, with traditional kingpost design. A 13sqm wing but with Quik performance, a trim range of 55-80mph making it perfect for all occasions. Used by instructors, club pilots and competition pilots alike, it has taken it all without compromise. Holder of various world records from speed in a triangle to world record heights to winning world championships. The first Quik wing to introduce tip fins, and also the first with a 450kg maximum take-off weight. Tip fins ensuring great stability at all speeds and weights, not simply a fashion accessory but designed and optimised for performance and handling.